ANOTHER summer, another Pompey pitch relaid. Except this time the sight of sand is welcome, with the outcome anticipated to yield a playing surface to be proud of. Since Monday the Fratton Park pitch has undergone another round of essential repairs in an attempt to bring it up to scratch. Drainage problems last season severely hampered a surface introduced only last summer, rightly drawing plenty of criticism. Now Kestrel sports ground contractors have moved in to install a second drainage system, on the advice of pitch experts the Sports Turf Research Institute (STRI). As a consequence, lines of sand running at half-a-metre intervals have been dug into the pitch, linking up with primary drainage work carried out last summer. Having not been advised to carry out such improvements by the previous pitch contractors, Pompey are footing the bill. And the club are hopeful it can bring an end to their frustrating pitch woes. Mark Catlin, speaking to The News in the first part of a three-part interview, said: ‘The infrastructure work required for the secondary drainage was carried out before the pitch was covered for the Madness concert. ‘Now the top surface has come off and reseeding is to take place this week. ‘The concert has probably put us behind two weeks from where we would have liked to have been, but we have mitigated that by not hosting any pre-season friendlies here this summer. ‘We have been assured by the experts this will solve the problems we suffered last season. ‘But until we get our first period of extended rainfall and you can actually see it working, I don’t want to say it will definitely work because I am not a groundsman. ‘All you do is take on expert opinion, get professionals in to do it and then when the season starts we will see. ‘The issues have emanated from water failing to get through the topsoil into the existing drainage system, so what we have done is put in a secondary drainage system. ‘The company we previously used didn’t believe it was necessary, but the STRI have said if we really want a carpet of a playing surface we need to carry out such work. ‘I am confident it will be ready for the start of the season (August 8). That’s an eight-week timescale, which will give us plenty of time. ‘We never previously paid for secondary drainage because we didn’t have it. Our last pitch contractors believed the soil was of sufficient quality. Meanwhile, work is already well under way on resolving the same issues at Pompey’s Copnor Road training ground ahead of a June 29 pre-season return. 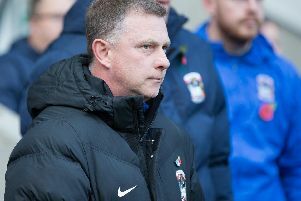 Catlin added: ‘We have had exactly the same issues at the training ground and work started there four weeks ago.